This is a Miraculous charm which is said to have multiple uses and benefits and is said to a most powerful and effective Indian good luck charm. Some of the uses of this charm have been given below. The person who writes this Yantra and always keeps it on his person is said to fulfill his wishes and hopes. The procedure is the same for someone who finds himself in any sort of danger, calamity or threat. If someone is suffering from evil eye, spells or curses then he has to put this charm in a locket and tie it around his neck as an amulet. This is said to remove the ill effects of the evil energies from his person. If someone is behaving irrationally and is possessed by ghost or any evil entities then this Yantra has to be washed in water and that water has to be given to the possessed person to drink for seven days. This is said to exorcise the evil spirits from the body and aura of that person. Is it ok to write it on plain white paper with blue ink and keep it in my pocket? Yes, however red ink is preferable to blue ink. Pranam Guruji,You havnt informed how to energise this yantra?is it like that we have to write it down with red ink on a white paper and keep it with us or there is some mantra we have to chant to energise it?One more question how long we have to keep it with ourself?please reply soon. There is no Mantra to energize the Yantra. It can be kept as long as you wish; if it gets damaged a new one can be prepared and the old one immersed in a river. Thank you guruji...give me your blessings . Should the practitioner of this yantra refrain himself from eating non veg diet or practicing any kind of sexual activity. kindly clarify-- I am not sure how these charms work and so i am not clear-- When i look at the numbers in the 4x4 square, for example the 6 is slightly shifted above the 5 on both sides of the 5. Also some numbers are bigger then others-- are those details important. sorry to trouble you but kindly clarify the details of the charm since i am totally uninformed about its operation. Does the 5 have to be shifted down like in your picture. does the 11 and 22 have to be smaller than 5 and 6 like in your picture. can we fold it and keep it in the wallet. Does it have to be oriented in a certain way when it is in the wallet. can we get it laminated in clear plastic or will that block/distort the energy. The picture is given only as an example the numbers can be written in any style,it can be laminated if you so wish and it can also be folded and kept anywhere in the wallet, there is no orientation. Hello i wanted to ask, so all i need to do is get a piece of paper and write the same exact Yantra and keep it on myself and it will bring me goodluck ?? I will like to know if this also Yantra gives good luck in the game of chance to the one who writes it and also do i need a specific day, date or time to write this Yantra. can we put two yantras in one locket together? Sorry for the repeated question the numbers 165627 and 165613 seems to be repeating in the next row. Is that fine? Should yantras have similar sum totals of each row and column? Yes, the numericals are repeating, it is all right. Dear sir can i make this yantra by myself and keep in my child"s wallet or he himself has to make it. You can write the Yantra on behalf of your child and keep it in his wallet. Can I write it in Bhoja Patra and with Pure Gorachana ink mixed with Keshar, Kasturi, Agar, Tagar etc? There should be no problem on keeping these Yantras together, but it depends on the purpose for which you are using the Yantras. Yantras for the same purpose should not be used at the same time. I had answered your query a few days back, there is absolutely no problem in keep all these Yantras for the purpose of seeking their blessings. There will be absolutely no harm as these Yantras act like good luck charms and should bring you good luck. There should be no problem at all for you. When I finished drawing the charm, I had a big fight with my family. Lasted for 20 min. Anger continue till I took sandpaper to remove the numbers on the charm.The fighting stop. Why is it like that? Yes, there is no harm in keeping the Charm in the Purse during the Monthly Cycle. 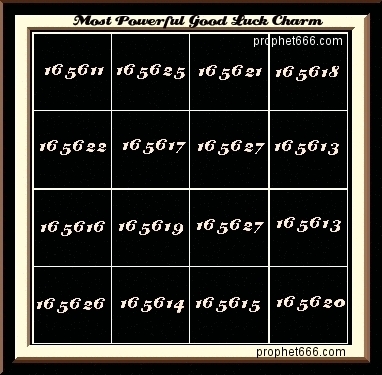 Namaste guruji, i want to use good luck charm mantra. Could you please guide me how to use that. Dear guruji, a friend of mine wrote this charm, but had a very bad day, sales was bad, someone scolded her for no reasons, all debt collector came at the same time and pressure her. Why is that happened? I tried this mantra. I will update any results here.. in near future.